It is my first time in Hongkong and Macau and I'd like to make the most out of my trip. I would like to go in most tourist spots but I don't want to waste so much time getting lost so I've been planning this trip since Feb and so far this is what I've got. I hope somebody can comment and give an advice regarding transportations, MTR stations and exits to and from the most tourist attractions. Take MTR from Jordan to Central and then take bus 6X to the Ocean Park. The metro fare is about HKD8.5/person to take MTR to Admiralty then bus 629 to Ocean Park. Q: how will I get from ocean park to TST promenade for the symphony of lights? what MTR station and what exit? travel time? DAY 2 NGONG PING, PEAK, MADAME TUSSAUDS Q: is this doable? Q: will be staying in 1 Austin road, Kowloon. How will I get from there to Ngong Ping using MTR? when I get to the MTR station near Ngong ping, is the cable car station in the same place? If not how will I get there? How will i get from Ngong Ping to Citygate outlets? then, how to go to the Peak Tram station from Citygate outlet? lastly, transportation from Peak Tram station to Kowloon. Q: from Disneyland, how will I get to Causeway Bay? then from Causeway Bay to Austin road, Kowloon. Visit Macau tower, buy pasalubong at Rua de Felicidade, go back to Venetian, Wynn or Fisherman’s wharf. Q: I read from other blogs that it is wise to make use of the free shuttle buses in Macau. Does anyone have an idea how can I make use of it with my itinerary? I heard Macau is a small place, but still, I believe I can save so much time if I already have an idea where to ride beforehand. Suggestions? Comments? I hope someone can help me with this! thanks so much! Comments for HONGKONG-MACAU TRIP (first timers) ITINERARY 2011 (4 full days) kindly suggest and advice re transpo. What MTR lines and exits? Itenerary for Hong Kong 6d5n. We would like to go to the following attractions/sights such as disneyland, ocean park, peak, madame tussauds, buddha, night markets, trick eye, ride the cable car. We will staying at cynthia'inn at chungking mansion. Can you also include how to go from TST to the attractions indicate above. Hi i will be travelling with 5 other friends to HK on 24- 28 Dec 2015. Would like to visit all places of interest in HK. During 25 Dec - Christmas day, we have planned to go Disney land and Lai Kwai Fong. Need some help in the itiniary planning for the other days. travelling to hong kong for 3days 2night with 3 other adults. planning to stay at fortune hotel in mongkok area. i was thinking if buying the roundtrip airport express ticket for 4 is economical compared to taking a taxi. it will be our first time planing our own itinerary (was part of a tour before). We want to visit the Giant Buddha, The Peak, Avenue of the Stars, Symphony of Lights and devote a day in Disneyland. We also want to have day trip in Macau and if possible, see the House of Dancing Water. We will be staying in Novotel Nathan Road. May I also know the weather/temp during this time? Hi, can you pls help me to maximized my stay in hong kong (TST) for 3 days--- main attractions for me and my mom disneyland and ocean park and victoria peak. I'm travelling to Macau on Dec 9 and will be at HK from 10-12 Dec. I am pretty excited because it's my first time there and I have so many places and visit but I also understand that it is not possible unless I have a good itinerary. I would like to find out if there are any suggestions such as mode of transportation and probably a gauge of their fares? Will be spending a night there followed by 3D2N in HK. Just booked our accomodation at Emperor Hotel at Macau and will be staying at a hostel (Yesinn @ Fortress Hill). Kindly suggest an itinerary since we are first timers. what are the places we can go to have a memorable experiences. please include the transportation and the prices/rates. in our package there is included the disneyland on oct 19 and macau with lunch oct 20. our arrival is on oct 18 morning. where shall we go? Yes it is very possible and doable. From Hong Kong --> MTR to Lo Wu station (border bet HK and Shenzhen China, u need a China Visa to enter) --> Shenzhen Metro train Luobao Line --> get off at Window of the World station (31 mins/2.5RMB) --> Metro train Shekou Line --> get off at Shekou Port (25 mins/2.5RMB) --> take Ferry from Shekou to Macau (1 hr/150RMB). Hope this help and enjoy your trip! I am planning for my trip to Hongkong & Macau on nov.22-27.I'm so excited about it that I want to plan my itinerary as early as now.Can you please give me suggestions & how are the transportations? Thank you! Just for 4days and 3nights is it advisable for this itinerary for just accompany with my 7 yrs old daughter. As for plan for now but the trip will be next year for her birthday gifts since that would be my first trip outside Philippines. And would like to check if it easily to get along without booking in the agency or should have an agency due to my concern is my 7 yrs old kid by that time she's turning 7 already. Hoping you can help me then to check. i am amazed by how u answer all the queries here. me and my bf will be going to hk on jan16-20. i have no accommodation yet. can u suggest a hostel not so expensive along causeway bay or hongkong island or tin hau. whichever you think is accessible for first timers like us. we are on a budget and i am wondering what is most likely the best places to go during our vacation. Now e qn is...i dont see any 1day shenzhen info..i saw a 5days itinerary and wonder if i can visit the attractions( WOW, china, china folk, etc) mentioned in just a day? And if it is possible, any directions to these attractions? re: suggestion in your 12 days tour to HK, Macau, Shenzhen, and Guangzhou. Here's my suggestion in your 12 days tour to HK, Macau, Shenzhen, and Guangzhou. Spare 1 whole day each for Macau, Shenzhen, and Guangzhou then the rest to HK. Basically you'll have 9 days enough to cover most of the Hong Kong attractions that the city has to offer (pls refer to the links below on this page). For new year's eve in HK, do not miss the opportunity to watch live the very popular new years eve spectacular fireworks show at the Victoria Harbor. Vantage point will be TST promenade. hi guys, we are planning to go to HK on 20 Dec'12 from Jakarta, arrive in HK on 21 Dec and return again on 2 Jan 2013. Can you suggest which place should we visit the most tourist often go there for fist timer. Definitely we will visit HK Disneyland, and also want to go for Macau, Shenzhen and Guangzhou, can you help to make my itinerary for me, my sister and nephew 8 years old. Here's my personal itinerary suggestion based on the places you've mentioned to maximized your trip. Day 1: Arrival at HK airport --> Ferry transit to Zhuhai (you need a China Visa upon arrival at Zhuhai). Explore Zhuhai and get a hotel at Gongbie area (close to the Macau border. For more info, please read this topic discussion about getting to Zhuhai. Day 2: Zhuhai --> Macau. Explore the whole day in Macau and perhaps a finale at one of the popular casinos over there before heading to HK by Ferry at night. Day 5: Maybe 1 or 2 popular HK Museums --> final shopping --> departure. Hope that will give you some help for planning your itinerary. Hi, I need your advice as I plan to bring my children for their first trip in November. However I am working on a budget so I hope you can plan a 5 days itinerary for Hong Kong/Macau/Zhu Hai. The air ticket is cheapest from here to Hong Kong, and Hotel stay is cheapest at Zhu Hai. Is it advisable to fly to Hong Kong then travel to Zhu Hai. Will stay Zhu Hai's hotel first 3 days to tour round Macau and Zhu Hai, then back to Hong Kong for 2 days so I won't be late for my flight back home? Hello all, I am a fellow 1st time tourist to Hong Kong/Macau and have been doing my research. I noticed that many of you ask questions that have been answered repeatedly in this comment thread, I strongly suggest scrolling through this entire page, and I am quite sure your questions will be answered. Also, to get a good overview of where everything is, you can always type the names of the places on maps.google.com. Everything is shown in detail, including the MTR lines. Just my 2 cents worth, pity the super helpful person who has been writing the same things over and over again. Thanks, and I hope you all have an amazing time in Hong Kong/Macau/Shen Zhen. Hi would appreciate your assistance if u can suggest an itinery for 4(basically travelling with parents) from 3 Aug to 9 Aug? We will be flying to Hong Kong and plans to stay at Mirador Mansion but still cant decide which hostel (any suggestions as well?). For HK i guess we'll skip the Theme parks since my parents not keen on the rides etc but prefer more sightseeing. Then we plan to spend a day each at Macau, Shenzhen and maybe Zhuhai/Guangzhou while still staying in the HK hostel. I'm more confused with the planning of transportation available to the attractions in Macau, Shenzhen and Zhuhai/Guangzhou. Need your assistance! Thanks alot!!! Would you be able to help me with the intinary which i'm able to make the best out of it yet not too hectic. Any 3 to 4 stars hotels in Macau to recommend ? would walk ard macau and zuhai. from central am i able to take the star ferry to avenue of the star & symphony of lights ? After symphony of lights, able to advise where else to go . Ngo 360 and then Disney land is it feasible ? Last min shopping around hotel area . Hi! Pls. instruct me how to go back to kimberly hotel from HK Disneyland, ty! Peak in the morning til noon --> back to the hotel and check-out --> proceed to Tung Chung and stow your luggage at Citygate Outlets --> Ngong Ping 360 --> back to Tung Chung --> dining and final shopping at Citygate --> 10 mins @ HK$45 taxi from Tung Chung to HK airport. Above route would save you lot of time and also, most of the hotels check-out time is before 2:00pm. Getting to the Peak from Butterfly On Prat Hotel Hong Kong: This route would be the cheapest, efficient, and most scenic. Walk 10 minutes to the TST promenade, this will give you a change to see the Victoria harbour beautiful day-view --> stroll along the TST waterfront until you reach the Star Ferry Pier --> take the Star Ferry to Central (9 mins @ HK$2.5) --> walk to the nearby Central Pier bus terminus --> take the bus 15C (bus service starts @ 10:00am) to the Peak Tram lower terminal at Garden rd, Central for 10 mins ride @ HK$4.2 --> Peak Tram to the Peak. Pls follow same travel route in getting back to the hotel in reverse order. We have arranged a luggage deposit in our hotel so we planned to pick them up again at night. at the last day, what do you suggest, the peak then ngong ping 360? or Ngong ping then the peak? then, last minute shopping, back to the hotel then airport. is this ok? If its better to go to the Peak first, can you please give the direction on how to get there from the hotel? Victoria Peak and Ngong Ping in your last day is also a good itinerary. In that case, you can carry your luggage to Tung Chung and use the luggage lockers for rent available at Citygate Outlets and then pick it up later after coming back from NP and before heading to the airport, of course after a final shopping at the Outlet mall. You should be at Ocean Park before 12:00 noon and head directly to the Headland by cable car as most of the fun and rides are located in there also, do not miss to see the fantastic dolphin show at 1:00pm. Later, get back to Lowland for a glance at the Panda before finding your way to exit the park. Here's how to get to Disneyland from Butterfly on Prat. MTR train Tsuen Wan Line from TST to Lai King station --> change to Tung Chung Line to Sunny Bay station --> change to Disneyland Resort Line to Disneyland (38 mins @ HK$17) then Exit A --> walk 4 mins to the park main entrance. Here's how to get to Ngong Ping from Butterfly on Prat. MTR train Tsuen Wan Line from TST to Lai King station --> change to Tung Chung Line all the way to Tung Chung station (38 mins @ HK$14.1) and then take Exit B --> walk 4 mins to the NP 360 cable car terminal --> cable car ride to Ngong Ping (25 mins @ HK$125 - round trip ticket, recommended). We have changed our flight on the 4th day at 10pm. On the last day, we plan to go to Ngong Ping 360 and Victoria peak and some last minute shopping, is it possible? Or is it ok to go to Ngong ping on the 3rd day in the morning and ocean park in the afternoon around 2pm? Will we miss some good shows in Ocean park if we come at this hour? Could you also tell me the direction going to Disneyland and Ngong Ping from Butterfly on Prat? Butterfly On Prat Hotel Hong Kong - is a 4-star hotel located at 21 Prat Avenue Tsim Sha Tsui Kowloon Hong Kong. It is about 5-min walk from MTR Tsim Sha Tsui Station. Use Exit A2, walk along Humphrey’s Avenue, cross the Carnarvon Road to reach Prat Avenue. Also, the hotel is about 12 mins walk to the TST waterfront to visit Avenue of Stars or watch the Symphony of Lights show. The hotel location is generally good. After Disneyland, you can still do shopping until 10:00pm and the suggested place is somewhere in Causeway Bay. Take the MTR Causeway Bay from Disneyland (41 mins @ HK$21.7) then take Exit D1 and walk 3 mins to the wtc more a trend-setting mall with international brands as well as Michelin recommended and sea view restaurants. Here are more well-known shopping mall at Causeway Bay. Going to Macau, there's NO need to buy tickets in advance as you can easily get it when the time you arrive at the ferry terminal. The street markets are still open until 11:30pm. Getting to Ocean Park from Butterfly On Prat Hotel Hong Kong is easy. Get into the TST MTR station --> take the Tsuen Wan Line to the next station - Admiralty station (5 mins @ HK$8.1) and then take Exit B --> take bus 629 that will bring you straight to Ocean Park entrance (25 mins @ HK$10.6). From Ocean Park, the best place to go is the TST waterfront for Avenue of Stars and Symphony of Lights show @ 8:00pm and then a finale of street market shopping. Departure day - I afraid you don't have enough time to do shopping at the city as most of the shopping malls will open at 10:00am considering you need to be at the airport 2 hours before your flight. I would suggest you just go to directly to the airport in the morning and do shopping at the well-known Airport shopping malls. The Kimberley Hotel Hong Kong is located at 28 Kimberley Road, Tsimshatsui, Kowloon, Hong Kong. To have more efficient ferry to Macau, I would suggest you get into the Hong Kong Macau Ferry Terminal at Sheung Wan. Here's how to get there from Kimberley hotel. Take a 12 mins walk or a short taxi drive (@ HK$20) to the TST Ferry Pier --> take the Star Ferry to Central (9 mins @ HK$2.5) --> walk 5 mins to the ferry terminal --> take either turbojet or cotaijet to Macau (about 60 mins journey @ HK$151). Ferry service is 24 hrs. Upon exit at immigration in Macau, there are free shuttle bus provided by most of the hotels if you're going to stay there or you want a visit to their casinos. Otherwise, if you only wanted to see the Macau attractions (pls follow link to see attractions location map), I suggest just take a taxi straight to the Senado Square (the main plaza) as most of other attraction are walking distance from that point. Don't worry Macau is just a very small place. Just take a taxi in your to get back to the MAcau Ferry Terminal. Bus is not recommended, too slow and will kill your time. A Taxi from Macau proper (like at Senado Square) to the Macau Ferry terminal is only about 10 mins drive @ MOP40 or HK$40. HK - Macau currency conversion: 1 Hong Kong Dollar (HK$) = 1.0245 Macau Patacas (MOP) so almost 1:1 and don't worry HK$ is widely accepted in Macau. Hi! I hope you can assist me with my itinerary for Hongkong and Macau esp on the transportation. It's my first time and traveling with my child. We'll be arriving HK at 9AM. Our main destination in HK is Disneyland, but would like to be able to have a simple tour around as well. We'll be staying at the InterContinental Grand Stanford in Tsim Sha Tsui. And then, Holiday Inn Macao Cotai Central in Macau and have to be back to Hongkong before our 9AM flight back home. I would like to know if the ff itinerary is possible and would not be too tiring for our trip in HK. And I got some questions in between. Q:How to get there if we come from KINGLAND APARTMENT, NATHAN ROAD, KOWLOON? How much is the fare if we take MTR or bus? As well as the Station Name and Bus No.? Q:How to get there from the Peak? How much is the fare if we take MTR or bus? Q:How to get there from the Ocean Park? How much is the fare if we take MTR or bus? Q:We have 5 itineraries for this day, is it too much? or should we take Avenue of Stars and Symphony of Lights on the 3rd day. Q:How to get there if we come from KINGLAND APARTMENT, NATHAN ROAD, KOWLOON? How much is the fare if we take MTR or bus? Q:How to get there from the Giant Buddha? How much is the fare if we take MTR or bus? Q: Any suggestion that we should go to in Macau? Q: Any suggestion on where we can have our shopping at a budget price? This is our 1st time in HK, thus, I want to spend the most out of our time, but not too tiring that we will not enjoy our trip. Need help to plan itinerary on my 6D5N HK & Macau. P/S: Will be staying in disney holleywood hotel on the last night. Let me know if additional info is needed. We will be having a stop over in HK for 4 days and 3nights. We are planning to stay in Butterfly on Prat in TST (is it a good choice?). we will arrive at HK at 6am, what is the best way going to the hotel? we are carrying 2 check-in baggages and 2 hand carry trolley bags. We are planning to go to Disneyland on the day we arrive HK and stay there until fireworks. what places can you suggest to go after? On the 2nd day, we will go to Macau for a day tour, where can we buy the tickets? shall we buy them day before the trip to Macau? at night, I am planning to go shopping on the street markets, do you know what time they will be closing? On the 3rd day, we are planning to spend the day at Ocean park. can suggest how to go there? Any suggestions after this? On the 4th day, we wanted to do some shopping but my flight will be at 2pm.. is it still possible? on the 4-day stay, we wanted to go to Disneyland, Macau, Ocean Park, the peak and shop at best bargains stores/street markets. can you please suggest best way to do all of these? maybe there are still other HK attractions we must not miss. Hi! Pls. instruct me how to go to Macau ferry terminal from kimberly hotel? is it the NWFF, turbojet or cotaijet we are going to board? how much is the fare? From MAcau terminal are there free shuttle buses there, where is it located? I want to visit Senado Square, Ruins of St.Paul, Monte Fort, Sands Casino,the Venetian & City of Dreams. other places to go nearby, pls. suggest? Where can we get free pass for the shows? Pls. help me how to group the places i want to visit so that we can maximize our time, pls help us how to use the free transpo. Btw, we are 4adults & 2 kids, we want to be back at Ferry Terminal going back to HK at 5:00 PM. Also, pls. advise us how we can go back to the terminal. Thank you so much, your advice will be a great help to us! You can easily buy The Peak tickets at the Peak Tram Lower terminal at Garden Rd, Central. And yes, there are also combo tickets available where you can get some discounts. Like for example, the Peak Tram ticket will cost HK$40 (round trip) and the Madame Tussauds ticket price is HK$160 but you can buy a combo ticket package for Peak Tram round trip ticket + Madame Tussauds ticket at HK$185 so that you'll save HK$15. Hi! Where can i get tickets for the peak tram and madame tussauds. Are there discounted tickets for the combination of the rides and entrance of the above? thanks. Day 1: Hotel --> TST Ferry Pier --> Star Ferry ride to Central (9 mins @ HK$2.5) --> bus 15C to the Peak Tram terminal (10 mins @ HK$4.2) --> Peak Tram to The Peak + visit to Madamme Tussauds --> Back to Peak Tram Lower station --> Open-top bus no. 15C from Lower Peak Tram station to Central Ferry Piers --> Star Ferry ride from Central to Tsim Sha Tsui --> stroll along the TST promenade to visit the Avenue of Stars and watch the Symphony of Lights show --> you can opt for street market shopping. Day 2: Hotel --> MTR TST station (thru Exit B) to Disneyland Resort station (39 mins @ HK$17) + fireworks show at 7:00pm --> shopping at TST shopping malls close to the hotel. * Pls follow this link (pls scroll down to the post dated "Jul 01, 2011" on that page) to read details about "The Kimberley Hotel Hong Kong" and travel instruction between the hotel and to the HK attractions you've mentioned. * Pls follow this link and scroll down to the post dated Nov 07, 2011 on that page for travel instruction from HK airport to Kimberley hotel in TST. * Here's a travel instruction in getting to Ocean Park from Tsim Sha Tsui. Hope it helps and enjoy your stay in HK! pls. help me plan our trip to hongkong, pls advice transpo, MTR lines and exits, and fares/tickets. From your suggested itinerary pls. guide us how we can go back to our hotel at Kimberley hotel. on day 1, from our hotel @ around 2pm, we want to visit the peak, Madamme Tussauds, avenue of stars, etc. day2-HK Disneyland. Day 3- any suggestion? thank you! Getting to Ngong Ping: Follow the same route for Disneyland but get off at the last station, Tung Chung Station and take Exit B (37 minutes @ HK$18.8). Walk about 4 minutes to the NP 360 Cable Car terminal and then take the cable car to Ngong Ping for 25 minutes @ HK$115 for round trip ticket (recommended). Here's more travel guide in getting to Victoria Peak (post dated feb 21, 2011). Getting to IKEA: Get into Central MTR station and take the Island Line going to Chai Wan and get off at Causeway Bay station Exit E (7 minutes @ HK$4.6) then walk 3 minutes. The Garden View YWCA Hotel Hong Kong (pls follow link to read hotel more info) is rated 4-star hotel located at 1 Macdonnell Road Central, Hong Kong Island, Hong Kong. Getting to your hotel from HK Airport: Take the Airport Express Trains all the way to Hong Kong/Central station (33 minutes at HK$100). Take exit G and take a taxi (9 minutes at HK$18). Getting to Disneyland: Get into Central MTR station and take the Tung Chung Line trains going to Tung Chung but you need to get off at Sunny Bay station. Interchange trains to the Disneyland Resort Line (37 minutes at HK$21.7). Getting to Ocean Park: Get into Central MTR station and take the Island Line going to Chai Wan and get off at Admiralty station Exit B (3 minutes @ HK$3.8). Upon exit, get on the special CityBus CTB 629 for about 25 minutes bus ride @ HK$10.6, an express bus travel between Admiralty (west) and Ocean Park (main entrance). Getting to the Star Ferry: Get back to Admiralty station and take the Island Line going to Sheung Wan then get off at Central exit A (3mins @ HK$3.8). Follow directional signs to Central Pier Bus Terminus (walking distance to the Central Star Ferry pier). Get into the Star Ferry at Pier no. 7 for about 9 minutes @ HK$2.5 ride to Tsim Sha Tsui Ferry Pier. Walk along the Tsim Sha Tsui promenade for the Avenue of Stars and Symphony of Lights which is adjacent to the pier. Can you please suggest the best itinerary for a 4-day HK and 1-day Macau tour? Our flight in on the 21st -25 of April and arriving at 10:00am in hongkong. This is our first time in Hongkong. We are also planning to go to IKEA? We will be staying at The Garden View YWCA Hotel in 1 Macdonnell Road, Hong Kong Central. Thank you so much in advance. Getting to Stanley Market: Get into Mong Kok MTR station. Take the Tsuen Wan Line going to Central and get off at Central, exit A (12minutes @ HK$9.9). Get to the Exchange Square bus terminus and take any of the bus numbers mentioned on the link. Getting to Jumbo Kingdom: Get back to Central station and get to the Exchange Square bus terminus then follow details found on the link. Getting to Lan Kwai Fong: Get back to Central and follow details found on the link. Here's a travel instruction in getting to Mong Kok from HK Airport (post dated Jun 28, 2011). Please click on the same link for travel instructions to Disneyland, Ocean Park and Ngong Ping. Getting to Macau, please refer to the above post dated Apr 22, 2011. For getting there instruction to the most of the attractions mentioned from Mong Kok area, pls follow this link and read thoroughly the entire thread. Do u have any suggestion of travel itinerary for 6 days (5 days HK and 1 day macau)in Hong Kong? We are staying in Mong kok. Thank you! I think the best day that you can visit Ocean Park is in your Day 4. You can check out from the hotel early and go straight to Ocean Park (opens at 10:00am) --> leave your luggage in Ocean Park (there are luggage lockers available for rent) while you explore the whole park --> go straight to HK airport by taxi at around 2:00 or 2:30pm (about 50 mins drive @ HK$350). You can buy Ocean Park tickets at Admiralty before taking the bus 629 or at the park main entrance @ HK$280 one day adult and HK$140 for children 3-11 years old. Here's how to get to Ocean Park from TST. Thanks sir for the above itinerary. We also want to visit Ocean Park, on what day can we include it on our trip. Also, where we can buy tickets and how we can get there from Kimberly Hotel. Thanks! Here's my personal itinerary suggestion to help you maximize your time in Hong Kong and Macau. First, The Kimberley Hotel Hong Kong (pls follow link to read more about hotel info and to view location map) is a 4-star hotel located at 28 Kimberley Road, Tsimshatsui, Hong Kong. About 2-3 mins walk to/from TST MTR station Exit B2. Day 1: The hotel location is superb as it is close to lot of well-know shopping malls and dining places. Then take a short taxi ride to TST promenade to visit the Avenue of Stars and to watch the spectacular A Symphony of Lights show at 8:00pm. Day 2: 38 mins @ HK$17 MTR from TST to HK Disneyland (don't miss the fireworks show at 7:00pm) --> then you may proceed to Causeway Bay by MTR (45 mins @ HK$21.7) for shopping or you may opt for street market shopping just near to your hotel. Day 3: Macau. When you reach Macau, just proceed to the Senado Square the main plaza, most of the attractions are a proximity to that area. Afternoon, if you want to opt for a Macau casino. Day 4: Shopping then departure. If your in a group, it could be more efficient if you take a taxi. It is about 37 mins @ HK$260 for a taxi ride direct to HK airport from Kimberley Hotel. Hi, Don! Kindly help me to plan our itinerary for 4D/3N HK/Macau. We will arrive at the airport at 1220, then will check-in at Kimberly Hotel. Btw, we are first timers. Day 1-We want to maximize our time to visit beautiful places here in HK, that is near in our hotel. Day 2 -HK Disneyland, other places to go. Also,pls. advice transpo, MTR Lines and exits. Hope you can guide me. Thanks a lot! Any suggestion (itinerary) for my short stay in hongkong. we also want to go to Macau. Hi Carie, please follow the links below for our recommended itineraries, see if you find something that suite your preference then you may post any further specific questions in this thread. Hi, can you suggest an itinerary if we arrive on Apr 27,8PM in HK and will leave on May 1? We also want to go to Macau. Is it possible? Largos Hotel Hong Kong is rated 3-star hotel with a superb location at 30 Nanking Street, Jordan, Kowloon, Hong Kong. It is only about a minute walk to and from Jordan MTR station Exit B2. 1) By Bus - Direct route: Take the bus CTB A21 from Airport Ground Transportation Center (bus stop no.1) to Prudential Center at 230 Nathan Road, Sham Mong Road (bus stop no.11). Travel time is about 57 minutes @ HK$33. 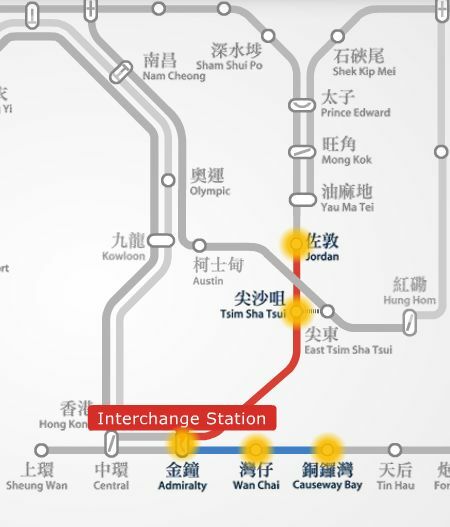 2) By Train, Airport Express + MTR: Take the Airport Express train from Airport to Tsing Yi station --> interchange to MTR Tung Chung Line train from Tsing Yi and get off at Lai King station --> interchange trains to the Tsuen Wan Line and get off at Jordan station then take Exit B2. Train travel time is about 40 minutes. Fare: Airport Express train from Airport to Tsing Yi = HK$60; MTR trains = FREE. 3) By Taxi - Direct route: Take a taxi straight to Largos Hotel Hong Kong from Hong Kong International Airport for about 39 mins drive @ HK$270. Hi! what are my options if I'll be going to Largos Hotel (Nathan Road) from HK international airport? Thanks. 1) You get to Guangzhou via Zhuhai from Macau. 2) Here's a travel route in getting to Hong Kong from Guangzhou. To Ding Ding Tram: Take MTR trains at Mong Kok station. Take the Tsuen Wan Line going to Central and get off at Admiralty station. Take exit C1 and board on the Ding Ding Tram at the tram stop outside Pacific Place. To Star Ferry: Get to Central station and take exit A. Follow directional signs to get to the Central Star Ferry Pier. Board on the Star Ferry crossing the Victoria Harbour to get to Tsim Sha Tsui. The Avenue of Stars is adjacent to the Central Pier. To Ladies' Night Market: Get to the nearest Tsim Sha Tsui MTR station and take the Tsuen Wan Line going to Tsuen Wan and get off at Mong Kok station. Take exit D3 and follow directional signs to get to the market. Please refer to this map (post dated August 18, 2011) for walking directions. Here's more in getting to Macau. Guang Zhou(GZ) - Hong Kong(HK) - Macau - GZ trip. 1) Would like to know which route is better and save journey duration if I travel from GZ. Route: GZ - HK - Macau - GZ (If we travel back to GZ from Macau, do I need to go through Zhuhai then only to go GZ or are there any direct route from Macau to GZ and what is the duration time? 2)How to go to HK from GZ? Fastest way. 3)How to go to Ah Shan Hostel, Mongkok? Itinerary as follows: Please give advise on the MTR line and how to get there. 2) Day 2 - HK (Check in Ah Shan Hostel, to Langham Place, ride Ding Ding Tram to round HK Island, Victoria Habour - ride Star Ferry to Avenue of Stars, Symphony of Lights (7.45pm) back to Ladies Street, Mongkok. Any good suggestion to add in?) Please advise direction from Ah Shan Hostel to the places mentioned. It's a 10-minute drive away from The Venetian Macao-Resort-Hotel. On March 10, we will be watching Zaia at the Venetian. Would you advise that we go to A Lorcha for dinner after Zaia or on March 11 for lunch? Thanks. 1) Here's a travel guide in getting to Macau from HKIA. 2) A Lorcha is located at 289A Rua do Almirante Sergio | Macau Peninsula, Macau, China. Getting to A Lorcha from Senado Square, i suggest you take a 10-minute taxi drive for taking a bus would take time. 3) Getting to Largos Hotel from Hong Kong-Macau Ferry Terminal: Take MTR trains. Take the Island Line going to Chai Wan and get off at Central. Interchange trains to the Tsuen Wan Line going to Tsuen Wan and get off at Jordan station, exit B2 (13 minutes at HK$8.1) then walk 1 minute to Largos Hotel. 4) Here's my suggested itinerary to maximize your HK trip. Here's a travel instruction in getting to Jordan MTR station from Hong Kong China Ferry Terminal. (post dated april 22, 2011, follow the path in reverse order). 2. how to go to A Lorcha, Macau from Senado square. Hi! My family will be going to HK from Macau via ferry on March 11. How do we go to Jordan station in HK from the HK Ferry Terminal. Your help will be highly appreciated. Thanks. Here's a travel guide in getting to Macau from Rambler Oasis Hotel. PLease help me get to Macau from our Hotel Rambler Oasis Tsing Yi. *Disneyland, Ocean Park, and Macau require a full day activity. Here's a recommended itinerary for your Hong Kong/Macau trip. Please refer to the above posts for another recommended itinerary. *A day is enough to tour around Macau. To get to Macau from Shenzhen, please refer to the link above. I would be appreciated if you could help me to plan my itinerary in Shenzhen. I will be staying in Shenzhen for 4 nights and during my stay in Shenzhen, I would like to make a day trip to Macau. Can you help me to plan my itinerary? Day 4. From Hong to a full day Macau tour. Getting from 1 Austin to the Hong Kong China Ferry Terminal. Take the Tsuen Wan Line MTR trains at Jordan station to the next station, Tsim Sha Tsui station (3 minutes @ HK$3.7) and then take Exit A1. Take about 10 minutes walk to the Ferry Terminal (see a walking map route here) or take a short taxi drive. * Journey time is about 60 to 75 minutes. Actually, there's a bus stop adjacent to the Ferry Terminal - the Terminal Maritimo. Bus fares usually around $4 and are in MOP currency. 1 Hong Kong Dollar = 1.0318 Macau Patacas (MOP). Macau is quite small but taking a bus would kill your precious time as most buses have a 30 to 50 stops that makes it slow (not recommended). It is recommended to take a taxi straight to your intended place of attraction that could be only about 10 to 20 mins drive from the ferry terminal (refer to the Macau attractions map above). Many of Macau attractions or sightseeing places are located close to each other. Hope this will help you plan your Macau itinerary. We'll be leaving on the 23rd of April and I am really grateful for your help with the transportation. I hope that you'll continue answering my queries. I really do hope you can still help me with my Macau itinerary because for me, this is the hardest to plan. Thanks so much, God bless! Day 3 in Hong Kong. Like Ocean Park, the HK Disneyland offers its visitors about a complete full day activity that starts from 10:00 am and end up usually at 8:00 pm when the fireworks is finished. Afterwards, going to HK Shopping - Causeway Bay for Shopping is very doable and a great whole day itinerary for your HK stay. MTR Route Option 2. A little bit faster but need to walk longer. Take about 10 minutes walk along the Austin road to the Austin MTR station entrance / exit F. Upon getting into the MTR station, take the West Rail Line trains going to Tuen Mun and just get off at the next station, Nam Cheong station then interchange trains to the Tung Chung Line going to Tung Chung station. Total train travel time is only 29 minutes @ HK$13.8. Afterwards, follow the directional signs in going to the to the Cable Car Terminal (about 5 mins walk from Citygate Outlets). Take the Ngong Ping 360 Cable Car from Ngong Ping 360 Tung Chung Terminal all the way to Ngong Ping 360 Ngong Ping Terminal. 24 minutes stunning cable car ride @ HK$80 single trip or HK$115 for round trip ticket. Take a tour to all popular attractions when you arrive at Ngong Ping village. Get back to Tung Chung by taxi or again by taking the Ngong Ping 360 cable car. From Tung Chung, get into the Tung Chung MTR station and then follow the procedure in MTR Route option 1 above in reverse order only you'll get off at Tsim Sha Tsui station and then proceed to the Tsim Sha Tsui Star Ferry Terminal which is located at the Victoria Harbour close to the Avenue of Stars. Getting to the Peak. Take the Star Ferry from TST to Central, 9 minutes @ HK$2.5. Nearby you find a bus terminal and take the bus no. 15C to the peak tram for about 10 minutes @ HK$4.2 and then take the Peak Tram to the Peak. From the Peak head back to TST with same travel route procedure in reverse order and from TST, get a taxi that will bring you straight to Street Markets - Ladies Street Market then walk to the Temple Street Night Market and you'll end up to Jordan area which is close to where you stay at Austin road. Here's an interactive map, connecting from TST Star Ferry Pier to Ladies' market to Temple street market and finishing at Austin road near Nathan road. Day 2 in Hong Kong. Visiting to tourist attractions such as Ngong Ping 360 then to the The Peak and going to some of the Street Markets for theme street markets during evening is very doable and a good day to evening activity to maximized your day while in HK. If you're staying in 1 Austin road, Kowloon then it would be a great location. You're a proximity to some of the famous street markets, to the popular Nathan Road that is known to be the main thoroughfare in Kowloon where a lot shops, restaurants and malls can be found, also, with a very efficient MTR trains is just steps away. The nearest MTR access to 1 Austin Road is the Jordan station entrance / exit C1 or C2. About Ngong Ping. I assume that you wanted to take the Ngong Ping 360 cable car from Tung Chung Terminal to Ngong Ping village. Otherwise, you can take a taxi for about 36 minutes drive @ HK$175 or a bus no. 23 (not recommended, too many stops and could take about 50 mins travel @ HK$17.2) from Tung Chung to Ngong Ping village. So here's how to get from Austin road, Kowloon to Tung Chung cable car terminal and the most efficient way to travel is by taking the MTR trains. MTR Route Option 1 (recommended to avoid long walk). What you've mentioned is already so helpful. For Day 1 in Hong Kong, the tourist attractions to visit like Ocean Park, Avenue of Stars, and then Victoria Harbour and opt for Symphony of Lights show at 8:00pm is a good whole day itinerary. I assume that you will be staying somewhere at Jordan, Kowloon area. So the most efficient travel route between Jordan to Ocean Park is by taking the MTR train from Jordan to Admiralty station and then take the bus no. 629 straight to Ocean Park. Here's the detailed information in getting to Ocean Park (Hong Kong Island side) from Jordan (Kowloon side). From Jordan MTR station, take the Tsuen Wan Line trains going to Central station but just get off at Admiralty station (6 minutes @ HK$7.9) then take Exit B. Upon exit, you'll find the Admiralty (west) Bus Terminus where you can take the special CityBus No. 629 for about 15 minutes trip @ HK$10.6 / person. It is an express special bus route between Admiralty (west) and Ocean Park main entrance. Here's how to get from Ocean Park to Tsim Sha Tsui Promenade (back to Kowloon side) where you can visit the new attraction, the "Avenue of Stars" and also, that would be a perfect place to watch the nightly show, the "Symphony of Lights" from the opposite Hong Kong Island side. From ocean Park, again, take the bus no. 629 back to Admiralty MTR station. Get inside into the MTR station and take the Tsuen Wan Line trains going to Tsuen Wan but you need to get off just right at the next station, the Tsim Sha Tsui Station (5 minutes @ HK$7.9). Still at subway, walk about 10 minutes to the adjacent East Tsim Sha Tsui station then take Exit J. Upon exit, take another 5 minutes walk to the TST promenade or to the Avenue of Stars.